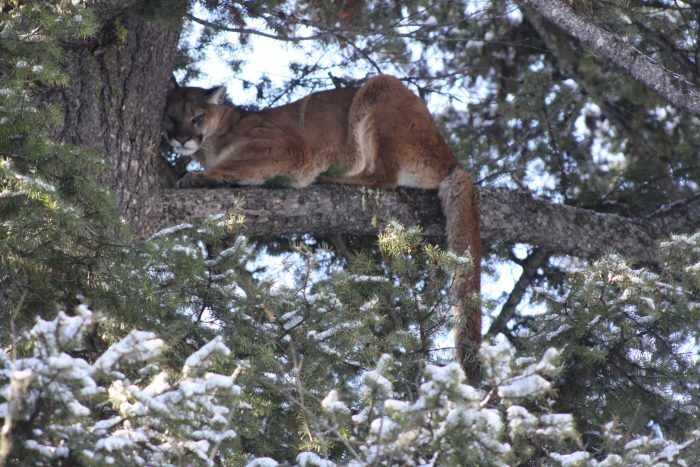 The hunting of male mountain lions in northwestern Montana hunting district 101, which includes portions of Lincoln and Flathead counties, closed at one-half hour after sunset on Sunday, Jan. 27, 2019. The hunting of all mountain lions in southwestern Montana hunting districts 312 and 393, which include portions of Gallatin, Park and Meagher counties, closed at one-half hour after sunset on Sunday, Jan. 27, 2019. The hunting of all mountain lions in southwestern Montana hunting districts 350 and 370, which include portions of Silver Bow and Jefferson counties, closed at one-half hour after sunset on Sunday, Jan. 27, 2019. The hunting of all mountain lions in Montana hunting districts 530 and 590, in portions of Fergus, Golden Valley, Musselshell, Petroleum, Big Horn and Yellowstone counties, closed at one-half hour after sunset on Sunday, Jan. 27, 2019. The hunting of male mountain lions in northwestern Montana Hunting District 104, which includes portions of Lincoln County, will close at one-half hour after sunset on Tuesday, Jan. 29, 2019. The hunting of all mountain lions in southwestern Montana hunting districts 322, 326 and 330, which include portions of Beaverhead and Madison counties, will close at one-half hour after sunset on Tuesday, Jan. 29, 2019. The hunting of male mountain lions in northcentral Montana hunting districts 410, 417, 419 and 426, which includes portions of Fergus, Petroleum and Judith Basin counties shall close at one-half hour after sunset on Tuesday, Jan. 29, 2019. The hunting of male mountain lions in north-central Montana hunting districts 418, 420 & 448, which includes portions of Judith Basin, Meagher, Fergus and Cascade counties, will close at one-half hour after sunset on Tuesday, Jan. 29, 2019. The hunting of all mountain lions in southcentral Montana hunting district 502 & 575, which includes portions of Carbon, Yellowstone, Stillwater and Sweet Grass counties, will close at one-half hour after sunset on Tuesday, Jan. 29, 2019.